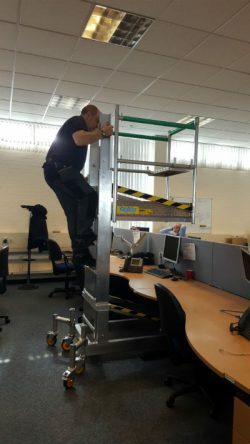 The desk surfer is a low level access platform that can be used to gain safe access over desks and other surfaces. The Desksurfer is similar to a Deskglider. How Does the Desksurfer ™ Work? The platform height is adjustable for both low and higher level applications. The Desksurfer can be easily moved through doorways and in lifts and then moved in to the required location. The platform can then be raised to gain access to ceilings and lights above desks. If you would like to find out more about the Desksurfer, then fill in the contact us form, email us, or call on +44 (0)1924 224392 and the team will be able to help with your enquiry.